Soooooooo, here it is.......the sign up! Just sign up below, stitch your little heart away on Friday night, and blog about it Saturday (or over the weekend....I know I'm always slow as I get on a roll and just can't stop!! ), and we'll all come and visit you to see what you got up to. Then, on Monday evening, I'll pick the winner (with the help of my good friend, Mr RNG) of this fab pack. If you need any more info, click on the FNSI tab at the top of the page. Otherwise, sign up and I'll see you Friday!!! Looking forward to this fun event, thanks for hosting! Hope my link works. But tired so I am not quite sure if it will. I have linked up, and will be doing some hand stitching while away with the kids and grandies. Hope to blog about it but will have to wait and see if there is internet coverage at the place we are staying. Keep a check on your mail..... just saying. Thank you for taking over for Heidi. I am looking forward to it. Wendy do you know where those canvas tags were done? I have someone who is wanting something similar? Looking forward to this. Thanks for hosting it. 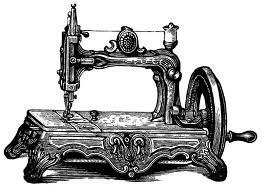 Looking forward to seeing how much sewing will be achieved. Looking forward to Friday night. My four are all off to the footy, so I'll have the house to myself! Happy to join you all! See you Friday night. Lovely Wendy. I will be there in my stitching uniform (Jim jams) and Chokkie. By hook or by crook I'm going to sew this Friday night! 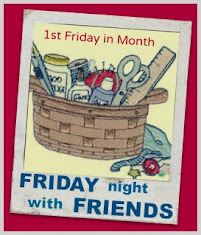 Looking forward to a lovely Friday night of sewing - 'see' you all then! Well, I am actually going to be sewing on Friday afternoon as I have an afternoon to myself and then we are out in the evening. But given time differences around the world I am still going to be joining in with someone! See you all Friday night :) Barb. Thanks for taking over the hosting of this. Will be sewing with everyone. I'm looking forward to it - given all the time zones, we'll be sewing around the clock. There will be stitches, maybe a mixture? You know I can't resist a good excuse to stitch. I'm signing up! I haven't participated in FNSI in a while, so I'm really looking forward to July 19th!! I'm so looking forward to this! See you all tomorrow! WooHoo, love Friday Night Sew In! I haven't participated in FNSI for some time, so I'm really looking forward to joining in tonight! This is my first FNSI. I think I will work on my Antique sampler designed by Sue Daley. See you tonight. Haven't participated in a while...looking forward to it! I don't quite understand the linky thing, but I do have a blog and I will try to remember to post on it tomorrow about tonight's activities. I'm up for a night of sewing!! I'm going to do some more cleaning and organizing and then work on a couple of projects. I'll post some photos tomorrow!! Thanks for hosting this!!! Great idea. Love all of us getting together to sew! I *really* wanted to enter, but it's been a while since I participated, and I kept getting redirected to other sites, so I finally gave up. However, I did make progress on my daughter's college quilt, so that's good! too late for me to sign - up? This will be good - I need some motivation. Almost every Friday evening I sew and listen to my favourite radio station - CJSW the university station here in Calgary - until the wee hours. Love Friday nights! I'll be back. I have a confession to make..